Spacing of posts is far too generous. Too much whitespace between lines. No syntax colorization of JSL code. Lots of wasted space at the top. The dark gray area with "JMP USER COMMUNITY Discussions is about an inch high on my monitor, and takes up a lot of space. Where's the "Welcome category"? The only way I found the super user board was with Jeff's link in his email. WELCOME link is in a funny place. At the top of the page: Community -> Other Communties - > Welcome. There's too much space between lines of text. See the attached .png file. I've circled areas of too-generous spacing. I'm reading all the replies to the discussion "Feedback about new discussion forum". 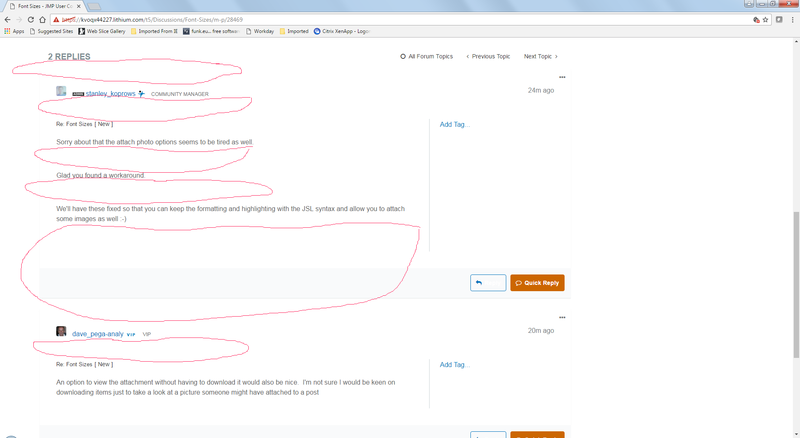 Each reply contains "Re: Feedback about new discussion forum" which seems redundant.